Frankly this has not been the best can jam month for me. Right off the bat, the theme(s) this month are not exactly my cup of tea. I appreciate that there was a choice – but for me it was a presidential election type choice. Which candidate do I dislike less, Asparagus or Rhubarb? I am not a huge vegetable fan and there are a lot of veggies that I just flat refuse to try for various reasons, but of the ones that I have tried asparagus is tied right up at the top with green beans for my most loathed vegetable. Rhubarb I have never actually tried. But rhubarb usually hangs out with my main man strawberry – so it can’t be all bad can it? Here in the south there really isn’t a rhubarb “tradition”, it doesn’t particularly like our climate and has never really gained the “acquired taste we love from childhood” status that I believe it has in other areas of the country. Other colder, norther areas. 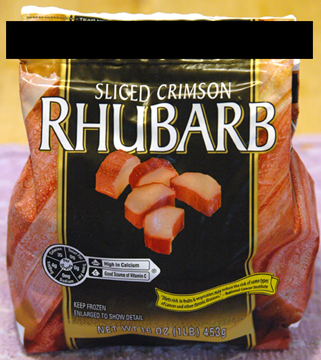 Added to that I do not care for things that are sour – so rhubarb has never been on the top of my to try list. But again, it has to beat asparagus. 3 Farmer’s Markets and 2 grocery stores later I determine, as did Bread Making Blog Lady, that rhubarb season here in Atlanta was last month. So I bit the bullet and went to the freezer section. I was ahead of the game. I had all of my ingredients ready to go and was going to can yesterday, but alas – this month’s can jam curse was upon me. Instead of a fun day canning with my mother (who brought me a whole flat of strawberries) we spent the first part of the day tracking down the horrid stench in my kitchen. Once we located the source we spent the rest of the day removing, disposing of and cleaning up after the DEAD RAT that had decided the space under my sink cabinet was a great place to shuffle of the mortal coil! Which leaves me, once again, sneaking in under the wire. There will be pictures after the mandatory 24 hour no touchie waiting period. Until then, y’all just have to be happy with the recipe. Took a picture – but really, not terribly exciting. I like shooting clear/semi-clear jams better. The Hardware: nothing special, check out the canning thing for equipment – this makes four 1/2 pints. Combine sugar, vinegar and spices in a non-reactive saucepan and simmer until the sugar is dissolved. Add the rhubarb and gently heat until it is no longer frozen. Add dried fruit and bring to a boil, reduce to a simmer and cook for 15 minutes – stirring occasionally. Turn off heat and stir in cilantro. 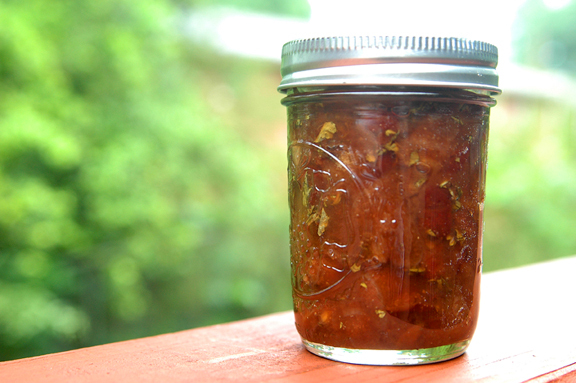 Proceed to canning process – 1/2 inch head space. Boiling water bath for 30 minutes sea level, adjust time for your altitude. I have no idea how this tastes. I wouldn’t even know what to eat it with, maybe pork? I have a feeling it will sit in my cabinet until I find some unsuspecting victim to foist it off upon. Or maybe I can con my hubby into eating it, I don’t know. I have a friend who is really into Indian food, maybe she will want it? Hey, if you think this sounds good – and you promise to give me feedback maybe I can foist it off on you? Drop me a line if you got the cojones.